Autumn is my favourite time of year without a doubt. It's such a beautiful, colourful, cosy time of year! I love updating my home with the changing seasons, and Autumn is the perfect time to add a few natural, homely and rustic touches. 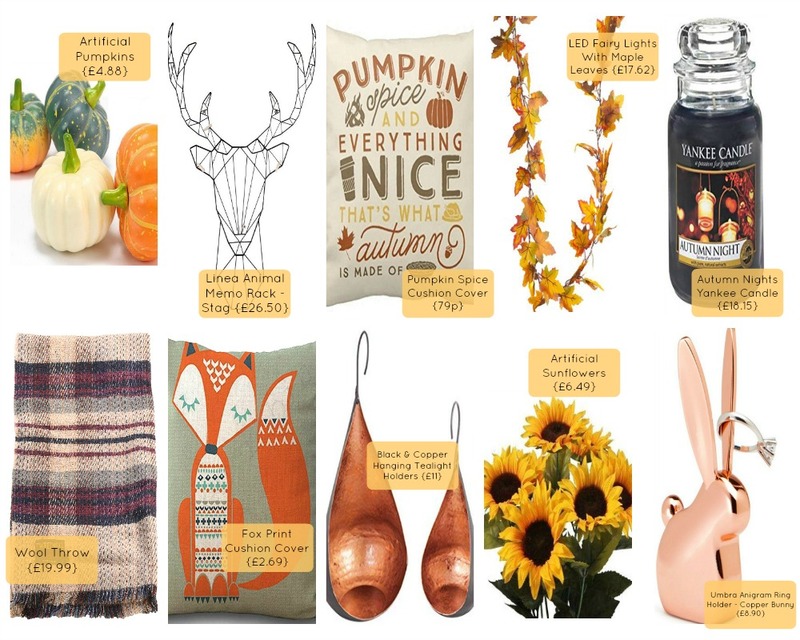 I wanted to share with you today a few of my favourite Autumn Home Decor Pieces! It's October which means you obviously need to decorate your home with a pumpkin or two! I love these Artificial Pumpkins, they're such a cute little size and as they are fake, it means you can use them again and again! I'm such a sucker for buying new cushion covers, you can get them for bargain prices and they are such a simple but effective way to update your home! This lovely 'Pumpkin spice and everything nice..' cushion cover is an absolute steal at only 79p! You can't have Autumn home decor without a few colourful leaves! What makes this garland even better is that it is actually a beautiful set of fairy lights! Not only are you adding a natural looking decoration to your home, but you are creating a snuggly, cosy atmosphere with them too. I really love this LED Fairy Lights With Maple Leaves garland, and it's such a bargain too. Every cosy home needs a beautiful smelling candle or two, and you can't go wrong with a Yankee Candle! This Autumn Nights Large Candle Jar has a beautiful, relaxing and slightly spicy scent to set the Autumn mood. Is it even Autumn if you aren't snuggling under a soft blanket and watching films? No, it's not! I really love the pattern of this Woolen Throw and the colour combination is beautiful. Perfect for chilly Autumn nights on the sofa. I mentioned how I love buying new cushion covers, and this Fox Print Decorative Cushion Cover is adorable! I love the print, and it's such a bargain too. Plus there are lots of other Autumnal designs to choose from if you prefer! We like having candles throughout the house during chillier weather. (We don't light them all, obviously, with little children around it's not a good idea!) But it's nice to have a few decorative ones around to set the mood. These Black & Copper Hanging Tealight Holders are so beautiful and stylish, I really love the colours. I love filling my home with flowers, preferably fresh flowers but when they aren't available I love a bunch of gorgeous fake flowers. Sunflowers are perfect for this season, and these Artificial Sunflowers would look lovely in a tall jug or vase on your dining table! Last but certainly not least, this gorgeous Umbra Anigram Bunny Ring Holder! Who wouldn't love a cute little bunny to take care of their jewellery for them - perfect for dressings tables, bedside tables or next to the sink to look after your rings. The copper/rose gold colour is so beautiful, and the bunny is a cute but chunky and sturdy size. It's a really unique item, with a gorgeous shiny finish. This post was sponsored but I did not receive monetary compensation. I received some of these products to review. All opinions are my own.